Summer of Series: You Haven’t Read That?! As I sit here writing this post, it is the day before Memorial Day and there are officially 12 school days sitting between me and summertime. *insert caffeine aided shriek here* Don’t get me wrong, I LOVE teaching my tiny humans, but I am beyond ready for summer, and you know what summer means…. LOTS AND LOTS OF READING! Summertime for me means trying to catch up on all the books I have to read, and I can’t say enough how ready I am for another summer filled with good times, good people, and of course, lots and lots of good books. Now a few years back I did a blog post series that I titled Summer of Series. My goal with that blog post series was to read through some of the many series I own. You see I have a thing for books, and especially series. I LOVE me a good series. (That’s probably why over the years I’ve continued to buy complete series like I need my next breath.) There’s just something about a good series, where you spend multiple books in one world with a set of characters that gets my heart beating just a bit faster in the best kind of way. Like for real y’all. Don’t get me wrong, I love me a good standalone novel too, but a good series is my absolute favorite and is something I live for! When I did my original Summer of Series I had set out to read around 20 different series, and I’m sure you won’t be surprised to learn that I failed at reading even a quarter of those series during that summer. But that being said, I haven’t given up on my love of series and I haven’t given up on my love for this blog post series, which is why I decided to bring it back for another summer filled to the brim with some amazing series. And I for one couldn’t be more excited to get this all started again! So welcome to Summer of Series: You Haven’t Read That?! For this summer I decided to pick some series that have been recommended to me for forever. These are the books and series that when I mention I haven’t read them yet, I get some serious side eye….hahaha, just kidding, but I do have a lot of people that ask me “You haven’t read that yet?” Many fellow readers, bloggers, and even some authors have told me I NEED to get to reading these books stat, so I guess it’s high time I start listening to them. For this post series, I decided that I would focus in on those highly recommended series to finally see what I have been missing out on all these years. (It also made for a pretty great blog post series title, if I do say so myself.) Some of these series I originally intended to read the last time I did my Summer of Series, and others have been added to my list over the years. Some of these series came out years ago, and others are more recent, but they’re all ones that I’ve been dying to read, and they all have been recommended to me sooooooo many times before. I know there are hundreds of more books and series I could focus on, and believe me I want to read them all, I just chose to focus on these ones because some of them have been in that big old never ending book basket for years, and they needed to see the light of day. Y’all get my crazy thinking, right? Right. 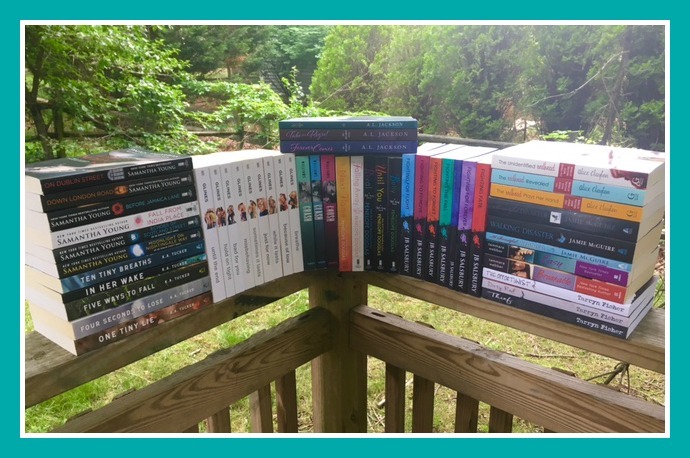 I’m hoping that this summer and this blog post series will allow me to get to as many of them as I possibly can, while also allowing me to connect with some of y’all about these books and how great I know they’re going to be! Now for the sake of realism, I realize that I’m yet again being a bit ambitious with how many series I selected to try to read, but I figure there’s nothing wrong with aiming high. So without further ado, let’s get this Summer of Series off to a good start! I’ve got some great posts, some giveaways, and some good books planned for the summer, and I hope y’all are as excited as I am! I also hope y’all have some great books you plan to read too because you know I’d LOVE to talk about them! So here’s to the next 3 months filled with some amazing series that I can’t wait to dive into! p.s. If you have a series from the picture that you would recommend me starting with, please feel free to comment with your recommendation! Listed below are the series pictured that will be part of Summer of Series. Click the series title to head to Amazon for that series, and click the author’s name to head to their website.